READ Educational Trust is extremely pleased to announce that the winner of the Word Warrior 2016 Competition is none other than ten-year-old Jessie McAvoy from Cape Town. The Word Warrior 2016 Competition was launched as part of READ’s annual Readathon Campaign, which aims to encourage reading and writing among South African youth. Aimed at learners from the ages of nine through 16, the competition required entrants to write about absolutely anything that tickled their fancy. A wonderful cross-section of genres was among the entries: fiction, action, horror, fantasy and more. Several entrants were wordsmiths of note, and entries were of a particularly high standard. St John’s RC Primary School entrant Jessie McAvoy caught the judging panel’s collective eye with her story entitled ‘A Detective’s Life’. The level of creativity employed showed tremendous talent. Every line made you want to go on to read the next, and a fine thread of sharp wit was woven in this quirky detective’s mission. 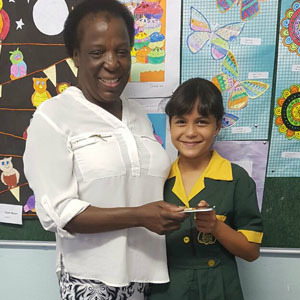 Jessie was extremely pleased to win the R1 000 voucher, and her school was ecstatic to hear that her winning entry won them R5 000’s worth of books. A wonderful boost in the quest for literacy! Jessie’s teacher Suzanne Beck is proud of her talented learner’s achievement, and is confident she’ll go from strength to strength in writing.